Yantho Awerkion is a member of the Timika section of the West Papua National Committee (Komite Nasional Papua Barat, KNPB), an organisation which since around 2008 has organised large demonstrations around Papua, often calling for a referendum on West Papua’s political future. 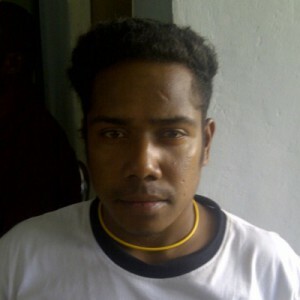 At the end of September 2012, nine KNPB members were arrested around Wamena, accused of possessing material for making bombs. On 19 October the web of investigation spread to Timika, with raids taking place throughout the night on the KNPB secretariat and members’ homes. Around twelve people were arrested in all. Six of the men were released on 24 October, and the remaining six men were held and charged with possession of explosives: Steven Itlay, Romario Yatipai, Paulus Marsyom, Yantho Awerkion, Jack Wansior and Alfret Marsyom. According to the KNPB the first arrests took place at 01:00 at Alfret Marsyom‘s house where he was arrested along with Paulus Marsyom, Yantho Awerkion and Jack Wansior. Alfret Marsyom was then forced to point out to the police the location of Steven Itlay and Romario Yatipai‘s houses. The arrested were brought to Police Headquarters at Mile 32 Timika, where they later reported that the police tried to force them to admit to owning and making indigenous Biak arrows, and in the case of Yantho Awerkion, a bomb used for fishing. When Yanto Awerkion denied knowledge of the accusations, police reportedly hit him and pierced his eyes with a broomstick. As day broke, a crowd of KNPB sympathisers gathered and travelled to the Mimika Police Headquarters at Mile 32, where they were told that the arrests were made because KNPB had been fabricating bombs, and also because there were activities planned between 19 and 23 October. The police’s version of events was reported in the Bintang Papua newspaper. In a press release the police claimed that they had found bomb-making material in two locations: Steven Itlay‘s house and Romario Yatipai‘s house. Among the materials they supposedly found were iron and aluminium pipes, a red powder which was being examined in a forensic lab, and 1.6kg of high explosives. A few days after the arrest at midnight on 22 October, Jack Wansior was reportedly tortured. He states that he was hit by several masked police officers whilst being interrogated. He was then blindfolded, and with his hands cuffed behind his back, he was forced to get inside a box, where police continued to beat and interrogate him, demanding where they could find the bombs and weapons. He was also allegedly hit on the head with the back of a pistol and threatened that he would be killed. All six men were charged with Article 106 of the Criminal Code for treason and Article 1 paragraph (1) of the 1951 Emergency Law 12 for possession of explosives. On 14 February the Defence Counsel stated in their demurrer that Awerkion was charged with two primary charges, going against the rules set forth in the Indonesian Criminal Code. The police also used violence during the arrest and denied Awerkion legal counsel when he was detained. The Defence also argued that the Prosecutor’s indictment of the offences charged to the Defendant was inaccurate, unclear and incomplete. On 7 March two Mimika police officers and another officer from the National Police Headquarters in Jakarta were called to testify as witnesses. One of the defence lawyers, Gustaf Kawer, stated that the explanation given by the two witnesses had no correlation with the indictments. Kawer told journalists that it was not possible to associate the possession of sharp weapons with the peaceful demonstration the KNPB had organised on 23 October 2012, arguing that there was no proof that demonstrators carried weapons. He also argued that these objects were widely available in markets and so possession cannot necessarily be considered a crime. As at April 2013, the trial continued.